Natural ingredients may take pretty long time to remove facial hair permanently but they are far better from chemical treatments that promise instant results. Like most areas of the skin, the face also contains hair follicles, so it is not surprising that those hair follicles could sprout hair. Having very fine and light coloured hair on facial skin is pretty common for a female but occasionally a few thicker and longer hair may develop and that may seem a little alarming. Chances are you have looked into the mirror and convinced yourself that you are the only one facing such a woe. Wrong, many females probably do. They are also just feeling self-conscious and quietly shaving it off so that no one would know their dark secret, either. So if you have dark and thick hair on your face, be rest assured that you are not the only one. And it is totally normal. It is typically more common in women with darker skin or hair. Also, it tends to run in families, so you may be more likely to have unwanted hair growth if your mother, sister or any other female relative also has it. Other reasons may be due to higher-than-normal levels of androgens. All females produce androgens, but the level typically remains low. Certain medical conditions can cause a woman to produce too many androgens. This can cause thick and dark hair growth on the face and other body parts. Women in the Mediterranean, South Asian and Middle Eastern heritage are also more likely to develop this condition. 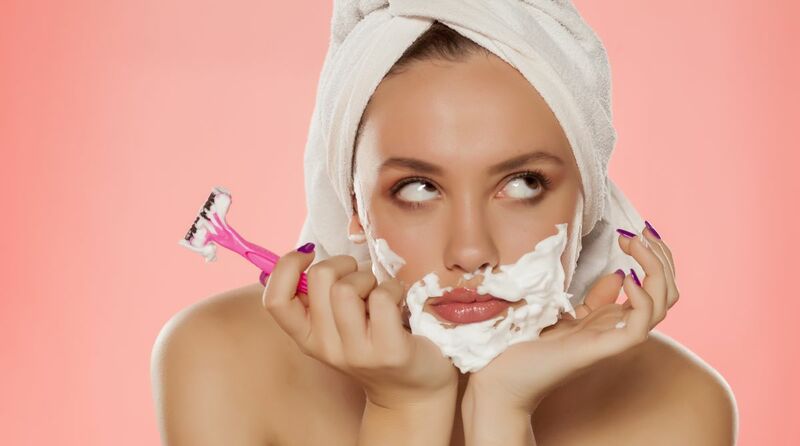 The presence of visibly dark and thick facial hair can lead to a feeling of self-consciousness, but it is not dangerous – however, the hormonal imbalance due to this stress can lead to bad effects on a woman’s health. You might be trying to thread off or wax off unwanted hair on your face. It can cause red blotches, swelling or sores. Relying on Mother Nature to eliminate facial hair is the safest solution. Though natural remedies take longer to show results, but embracing them would not damage your delicate facial skin unless you are allergic to any of the natural ingredients. · Take one-third cup of water. Add one-fourth cup of sugar in it. Add juice of half lemon approximately two teaspoons. Heat up this mixture for three to four minutes stirring occasionally on low flame. Let it cool down, apply it over your face in the opposite direction where hair grows. Let it sit till dry. Rinse off with normal water. Repeat this process thrice or four times a week until you see the results. · Chickpea flour/ or gram flour/ or besan is a well-known natural ingredient that is super effective to remove hair from the skin permanently. Take two teaspoons of chickpea flour. Add one-fourth teaspoon of turmeric powder, one teaspoon rose water and one teaspoon of lemon juice in it. Mix well to make a smooth paste. Apply it on your face. Let it sit for 30 minutes. Rinse off with water massaging your face in a circular motion. Repeat thrice a week to see fast results. · Another hair removing pack made of chickpea flour includes papaya pulp, almond oil and aloe vera pulp. Mix one tablespoon of besan with three tablespoons of aloe gel, one teaspoon of almond oil and one tablespoon of papaya pulp. Apply this paste on face and leave it for half an hour. Now scrub off the pack with wet fingers in the opposite direction of growing hair. After that wash off your face with normal water. Repeat this process thrice a week to see fast results. · Dry orange peel and lemon peel keeping them under the sun. Grind them to make a fine powder. Both the ingredients work wonder together in removing facial hair. Take one tablespoon each of orange peel powder and lemon peel powder. Add one teaspoon each of almond oil, ground oatmeal, olive oil and rose water. Mix well to make a fine paste. Apply this paste on your face. Leave for 15-20 minutes. After that, rinse off with normal water. Repeat thrice a week for the best outcome. · Take four tablespoons of ground oatmeal, two tablespoons of honey, one teaspoon of lemon juice and two tablespoons of mashed ripe banana. Mix all ingredients well to make a smooth face pack. Apply it evenly all over your face rubbing against the direction of your hair. Leave it for 15 minutes. Wash with lukewarm water. Repeat thrice a week to see the miracle soon. · Green gram flour is also a well-known ingredient like besan to remove facial hair easily. Mix two teaspoons of green gram flour in half cup of rose water. Mix well. Apply it all over your face, rubbing against the direction of hair growth and finally rinse with water. · Egg whites along with sugar work wonder in removing facial hair as both forms a sticky adhesive like a thin layer that aids in removing facial hair effectively. Take two egg whites. Add eight tablespoons of corn flour and four tablespoons of sugar in it. Whisk well to make a thick paste. Apply it evenly on your face and let it dry for 15 minutes. Remove this thin face mask with wet fingers rubbing in the opposite direction of the hair. This process might be a bit painful but it is very effective. These natural remedies have been used for a long time to remove unwanted facial hair. The ingredients used in these remedies have the potency to reduce the growth of hair with regular use providing the permanent solution from the problem of unwanted facial hair. They are super effective and easy solutions when it comes to removing facial hair permanently. Do not go for the treatments that promise instant results. You cannot imagine what harm can a single session do? Just a few that pop up every now and then is normal. It is because of genetics and regular hormonal fluctuations. But if the hair is very thick and coarse, or you have more than just a few strands, it could be a sign that your hormones are out of whack. It may still be normal, but it is probably best to see your dermatologist to ensure you do not have a hormonal issue that could be causing hair growth.